Who doesn’t like to get some cute clothes, shoes, accessories or in general anything for a half price? I am sure you are one of them. Stay and get to know when and where are the best places to go shopping! Spanish people like to go shopping and as a result shopping malls and street shops are making sure to keep them interested all year around. Summer and Winter sales every year result in the craziness not to mention Christmas or Black Friday deals. Summer and Winter sales last more than one month. Winter Sales very often start straight after the big year celebrations. Straight after the three kings on 7th of January or even on the first day of the year (1st of January). Winter sales normally last for two months until the end of February. However, in some cities, it can last up until the end of March! On the other hand, Summer sales usually start 1st of July and last until the end of August or the end of September. Both Summer and Winter sales are normally one of the biggest during the year, as a result great deals are guaranteed! 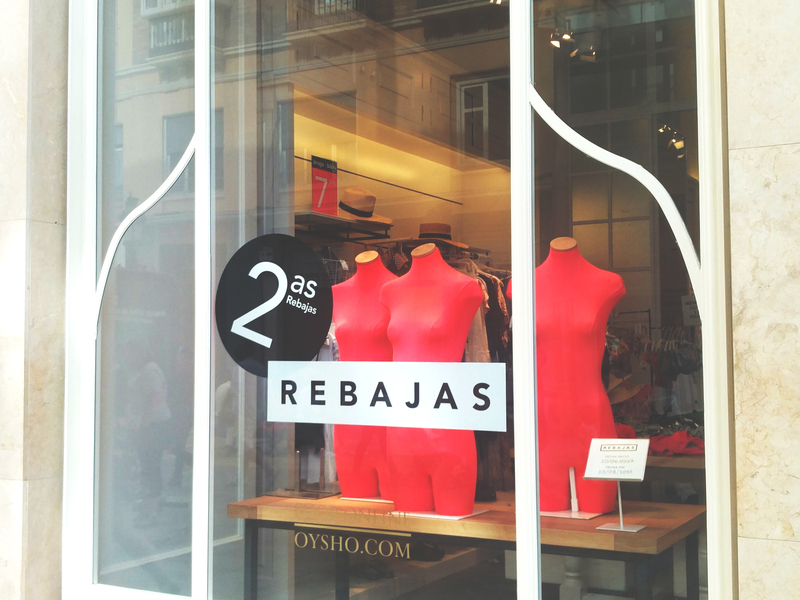 In between Winter and Summer, you can always expect to have Mid-season sales in Spain. During the Spring mid- season sales normally take place between March and June every year. On the other hand, autumn sales are normally present during September October and month of November. Note, these sales might not be the biggest but it is always nice to grab something that you like with even a 10% discount. Who doesn’t know Black Friday? Spanish people same as Americans get super crazy during this day. The big difference here is that Spanish Black Friday normally last entire weekend starting from Friday and Ending on Sunday. Big tip here is to make sure you know what you want and where this item stands before hand. Also, be the first one in line to grab it otherwise it might be gone! Unfortunately, we have to disappoint you and tell the truth that Christmas sales are almost not existing in Spain. However, during this time you can always find some special deals, gift sets, and items dedicated just for this time of the year. Although you won’t save money, however, to start looking for the gifts early might save you a lot of time and effort. Spain is big so each part of Spain, province, city, and village has different best places to shop. However, let’s talk about the main shopping malls and Spanish shops spread across the country. El Corte Ingles is the paradise of shopping. This 4th largest department store group is spread all across Spain and it is super popular among locals. There you can find a mixture of different brands of clothing, accessories, shoes, makeup, home appliances and more. Are you a big names lover? Armani, Calvin Klein, Lauren, Emidio Tucci, Ralph Lauren, Channel and other brands will be for your disposition. If brands are not so important for you don’t worry EL Corte Ingles is huge and offers a wide variety of brands which can fit the needs and pockets of everyone. More important, don’t forget to visit El Corte Ingles during the sales period. Great value for money in this department group is guaranteed. Who doesn’t know that Zara is from Spain? However, did you know that there are many more fashion brands and stores founded in Spain? Stradivarius, Bershka, Pull and Bear are just a few super affordable brand names which you will find in each big shopping mall and shopping street. Uterque, Massimo Dutti, Bimba and Lola are those more expensive and sophisticated Spanish brands which will definitely impress you! When it comes to sales, above mentioned brands are always great in sales. During the summer and winter sales they even do first and second sales, meaning that if you caught an eye on something what you really like and it is still available during the second sales round you are saving tons of money!